feeling stitchy: Pink Category Winner-Rainbow of Stitches Contest. This piece was already a favorite of mine -- so original with the subtle coloring and the addition of the beads which makes it ultra festive. She is a perfectly lovely representative for the pink category. CONGRATULATIONS! Congrats on winning for pink! Such a wonderful piece! What a beautiful piece! So inspiring, and PINK! Cogratulations on winning SewLovelyEmbriodery, you definitely deserve it. Congratulations! This is a beautiful piece of art. congrats! 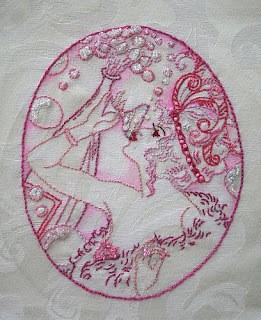 this pink embroidery is just lovely! Excellent! Your patterns and stitching always blow my mind. I love how literally bubbly this is & how the color choices further enhance that feeling...such a fun piece :) congrats!! OOH1WOW!I like the woman with the wine glass. Marvelous work. I love the flapper patern and you did an excellent job. Your so darn cute. Loved your interview and you have inspired me to try new things. Aw, thanks for the shout out, SewLovely! I adore your work. It's ornate and different and lively and happy.